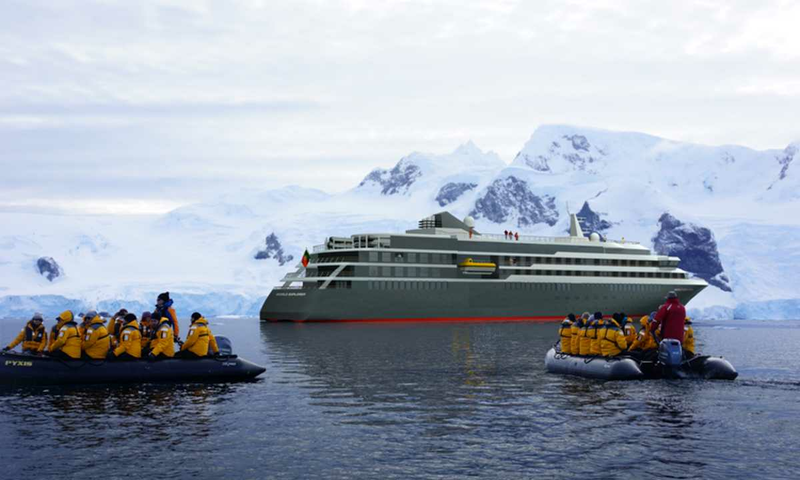 One of the new generation of ice strengthened ships poised to shake up the existing Polar Fleet, World Explorer sets the bar high with sleek design, fast average cruising speed, generously appointed cabins all with balcony and a unique glass-domed Observation lounge. 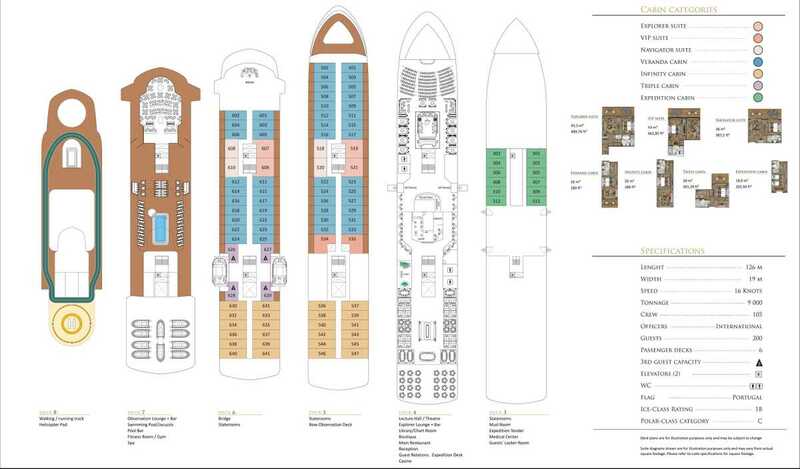 Located on Decks 5 and 6, and approximately 355 sq. ft. (33 sq. m) in size. These cabins have one double or two single beds, and a 110 sq. ft. (10 sq. m) walk-out balcony with access from sitting room and bedroom. A separate sitting area with sofa, refrigerator, TV, state of the art “infotainment” system, and private bathroom with shower, his & hers sinks, and bathtub is also featured in each cabin. Located on Deck 5, and approximately 334 sq. ft. (31 sq. m) in size. A separate sitting area with sofa, his & hers closets, refrigerator, TV, state of the art “infotainment” system, and private bathroom with shower and his & hers sinks is also featured in each cabin. 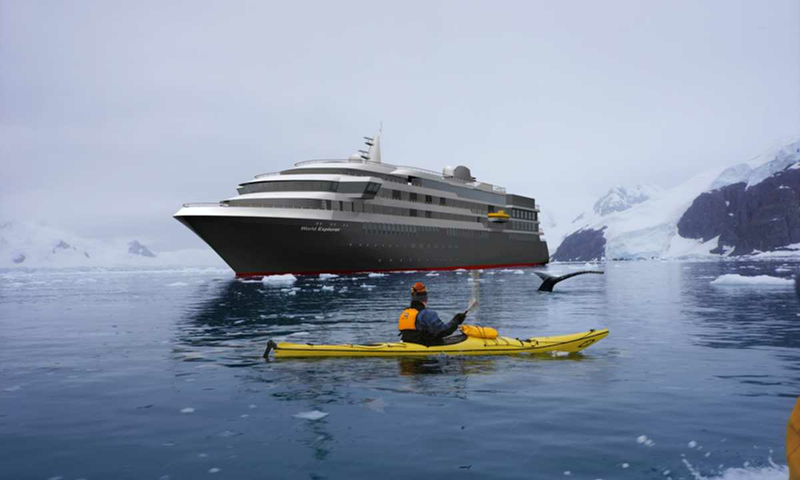 Located on Decks 5 and 6, and approximately 278 sq. ft. (26 sq. m) in size. A separate sitting area with sofa, walk-in closet, refrigerator, TV, state of the art “infotainment” system, and private bathroom with shower is also featured in each cabin. These cabins have one double or two single beds, and a floor-to-ceiling glass Juliet balcony. A sitting area with sofa, refrigerator, TV, state of the art “infotainment” system, and private bathroom with shower is also featured in each cabin. Located on Decks 5 and 6, and approximately 215 sq. ft. (20 sq. m) in size. These cabins have one double or two single beds, and a 55 sq. ft. (5 sq. m) walk-out balcony. Located on Deck 6, and approximately 242 sq. ft. (22.5 sq. m) in size. A separate combo sitting area/bedroom with a sofa bed and additional closet, refrigerator, TV, state of the art “infotainment” system, and private bathroom with shower is also featured in each cabin.